I really like this piece. It came without a scratch on it. And, it was very well package. It appeared to be no problem for my uncle and husband to put the top on, as well as, the sinks. I chose to go without the marble 4 inch backsplash because I think the white subway tile contrasts well. The doors are soft close and the drawers have a lot of space. The two drawers underneath the sink are "false drawers" and do not open. There is plenty of storage space in the cabinets. It is well constructed, beautiful, and looks great in our newly remodeled bathroom. Everyone who walks in there compliments me on the new vanity. The bathroom looks very chic and high-end. Five stars all the way. Introducing our exclusive 63 in. Hutton Spa Double Bathroom Vanity Sink Console with Pearl White finish perfectly combines sleek contemporary design with optimal concealed storage space for a truly exceptional bathroom vanity design. 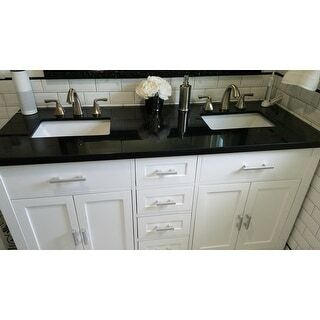 Double white porcelain rectangular under-mount sinks blend into the complimenting white Carrara marble specifically selected for this popular double vanity. It is completed with the infinity under-mount convertible sinks (US Utility Patent Pending) to give you a SPA like water feature when you want it. Four center functional drawers are built with dove-tailed drawer joinery and are flanked on either side by double-door cabinets with divided compartments. Matching back splash is provided as courtesy without warranty for matching characteristics, missing or breakage. Dimensions 63.0 In. X 24.5 In. X 36.0 In. We appreciate you taking the time to write a product review. We have verified this item uses a magnetic doorstop along with the soft close doors which may cause a clicking sound when the door closes. 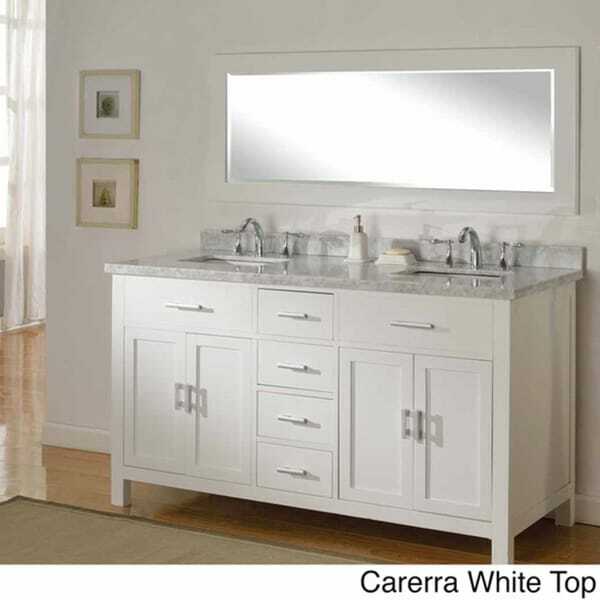 Additionally the vanity features soft close doors rather than self-closing doors. Thank you for shopping with us. Im smack down in the middle of pros/con with this item I purchased for a bathroom remodel. I researched all over for a 63" in. vanity and this one indicates it is - its not. The overhang, Carrera marble top is 63in. wide - not the base cabinet. The spa like feature with the drop in in the sink is bizarre and practically useless. 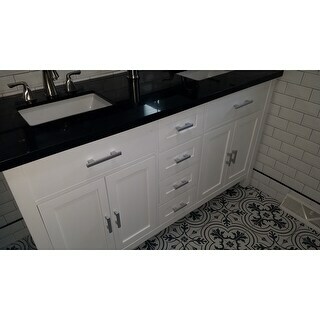 The cabinet itself is extremely well made - beautiful piece with hardware and backsplash, all is great on that end. The worst part of this purchase, which was and is extremely unsettling is the cut-out of the double sinks - the specifications (on item specs) show the size of the undermount sinks which is way bigger than the actual marble opening cut out leaving this vanity with two extremely small openings for the water to flow into the sink. I could imagine the water will be all over the marble counter top down onto the cabinet than the floor. What a shame and a disaster, esp. because this bathroom is for a rental and may not withstand the usage if not owner occupied. The delivery was good, although very heavy and they don't bring into the house. The mirror was cracked but we called overstock and they sent out a replacement after pictures were sent. If I could have found a marble company to come out and enlarge the openings of the sink this piece would have worked out well, physically and financially. Nobody is willing to do a larger cut-out because the Carrera is thinner than it appears on the end (doubled on end) and will not take a chance to break/crack the entire slab. I would not buy this again, especially in this day with all the big basin sinks making their entry, unless the openings for the sinks were larger (specifications need to be corrected on site) otherwise this could be a great piece. Great piece of furniture for the price/quality. For the money this is a good deal. The packaging was perfect! (can't say that for a lot of large items I have ordered). Nice quality, the top is very pretty - it is grey with some white. The drawers are well made and you do have to push them shut as some other reviews stated. The mirror is a nice added feature. The holes for the faucet are wide spread. The sinks are nice, I won't use the infinity inserts but if you like that look it would be nice. Very well built. Looks better than the picture. "What type sealer needs to be used on marble top?" A standard natural stone sealer can be used, following the proper instructions. Hopefully a perfect fit and really like the way it looks. 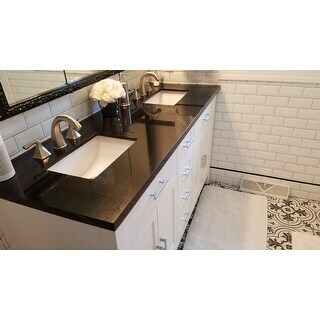 "Is the vanity available without the counter and sinks? My counter your typical, it has to be custom." This vanity is not currently available without the top. "How many inches is the distance between the center of the drains of two sinks?"" "Can I get this vanity in a dark brown?" Hello MarieG, unfortunately this item is only available with the white vanity within our inventory. Please let us know if you have additional questions. Thanks for shopping with us. "Is 'Pearl White' off white or true white? Also, can you provide me with the dimensionsof the countertop for the between the sink bowls and from the side of the sink bowl to the edge of the countertop. We're looking to build medecine cabinets into the wall, our contractors need to know where to place them, to be centerered over the sink bowls." Hello shannon, color as shown on picture. Words can’t distinguish better than the picture. But do note the lighting condition and monitor setting can be different. It is more true white than off white. Please let us know if you have any further questions. "Does the 63 inches wide include the countertop? Or is just the vanity measurement?" Hello kwille, 63 inches is the overall width, the width of just the base without the counter top is approximately 61 inches: Base: 35.25" H x 60.75" W x 23.25" D Countertop: 62.5" W x 24.5" D Hopefully that helps, thank you for shopping with us!